Encounter with the Embera – Wounan Indigenous communities, in the heart of the Primary Tropical Forest. Day 1: We depart from Panama City early in the morning, shortly after breakfast, on the Pan-American Highway towards Colombia. Along the way, we will stop for a short coffee break.Once we enter the Darien province, the paved road ends and we begin the rough 4X4 terrain.Later, we will board a piragua (dug-out canoes) to the Wounaan Village of Boca de Lara. The Wounaan are very curious about us, just as we are about them, and will tend to hang around to observe and see the newcomers. Traditional lunch will be served at the lodge. Later, we will discover the wonders of the mangroves in piraguas and tempt our luck at fishing like the locals. Day 2: After breakfast, we will leave our village to reach the Lagarto River, one of the largest of Panama and we will prepare us with our kayak to discover the secrets of the Rio and enjoy animals meetings… for a full day. Overnight at the lodge. Day 3: After a hearty breakfast, we will towards to Puerto Kimba by 4X4. There, we will board a “panga” outboard boat, which will take us to discover the Gulf of San Miguel; it’s Spanish forts, La Palma (Darien’s capital) and with some luck we’ll see some dolphins. Lunch at La Palma. Some of the birds that you may observe there are: pelicans, ibis, herons, frigates and kingfisher. 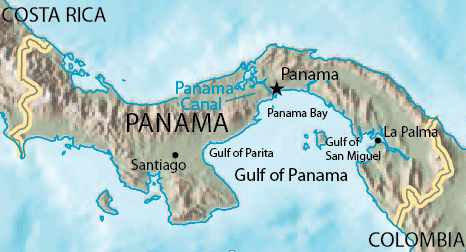 Day 4: In the early afternoon, we will have lunch at a local “colonos” farm and begin our return trip to Panama City. Our prices online are only available from 1 to maximum 1 people. Send us your request and we will send you the quote shortly.